It's easy to put on mass if you don't mind the pudge. Putting on muscle without the lard requires a more exacting approach. This guide points you in the right direction. Bulking for muscle without also increasing body fat can be just as tiresome, stressful, and frustrating as dieting to lose weight. Both necessitate a sound, consistent approach that requires you to embrace numerous tips and hacks to stay the course. Below are 12 critical mass-building nutrition keys. Combine them with a well-designed training program and supplements stack to ensure you set yourself up for success! To pack on quality mass, you have to take in more calories than you burn—there's no way around it. To ensure you're doing it right, you need to know the number of calories required to place you in a surplus. Don't guesstimate; you'll see better results if you actually measure what you eat. To figure out your caloric target, begin tracking your food intake while simultaneously monitoring the scale for 5-10 days. The goal is to gain between 0.5 and 1.5 pounds per week. If you don't, then it's time to adjust your diet. Adjust your caloric intake to ensure you're gaining at an appropriate pace. Remember, if you're gaining weight too fast, you're most likely gaining a larger percentage of fat mass. If you're not gaining at all, you need to boost the number of calories you're consuming. Soon enough, you'll zero in on the sweet spot. To ensure the caloric changes you implement are working in your favor, you need to monitor the change on your scale. The scale is not the only indicator of progress, but it's an objective, simple measure that will help confirm whether or not you're headed in the right direction. Two or three times a week, weigh yourself first thing in the morning after using the bathroom, and be sure to track your progress. Focus on the big-picture trend rather than obsessing about a single weigh-in. Growth takes time. Don't expect much change from week to week. Focus on the big-picture trend rather than obsessing about a single weigh-in. Growth takes time. Don't expect much change from week to week. Again, your goal is to gain 0.5-1.5 pounds per week. In three months, that's 6-18 pounds. Although it may seem insignificant, this slow pace is an indicator of success. It means you actually put on substantial muscle mass rather than just pounds of unappealing fat mass. As your training experience increases, your ability to put on muscle will slow, so savor every single pound you can. When it's time to prep for beach season, good news! You won't have to shed nearly as much excess fat. One of protein's major functions is to rebuild and repair damaged muscle tissue. When coupled with a challenging resistance-training program and calorie surplus, a high protein intake is advantageous for anyone looking to build muscle. Before focusing on total daily protein intake, focus on consuming a minimum amount of protein at each meal. More specifically, focus on high-quality animal protein sources. These are rich in essential amino acids (EAAs), particularly leucine. Leucine triggers muscle growth, and research shows that you have to reach a minimum leucine threshold to maximally stimulate muscle building.1 Most people require roughly 30-40 grams of high-quality protein per meal to reach that threshold. Your total protein intake should fall between 1.0 and 1.5 grams per pound of body weight per day. That's 180-270 grams for a 180-pound individual. Consuming higher amounts of protein has not been shown to be advantageous compared to the above range. In fact, eating much more may impede your growth, because protein is very satiating; you may not feel hungry enough to take in enough calories to support growth. Save those extra calories for carbohydrates and fat. Fat is very calorie-dense, providing 9 calories per gram, which is more than twice as many as carbohydrates and protein. Consuming both saturated and unsaturated fats is a surefire way to boost calories, but you won't be able to eat the same quantity of food. These kinds of fats provide numerous health and performance benefits. Unsaturated fats provide several heart and cognitive benefits and are also anti-inflammatory, meaning they'll help to support hard training.2-4 Saturated fats help to drive testosterone production and support an optimal hormonal environment. Fatty foods are delicious too! Eating palatable foods like peanut butter and guacamole make it much easier to consume the calories you need, compared to forcing down very low-fat or fat-free foods like broccoli and tilapia. As a reminder, watch food labels for trans fats, which are added during processing to add texture and to extend a food's shelf life. 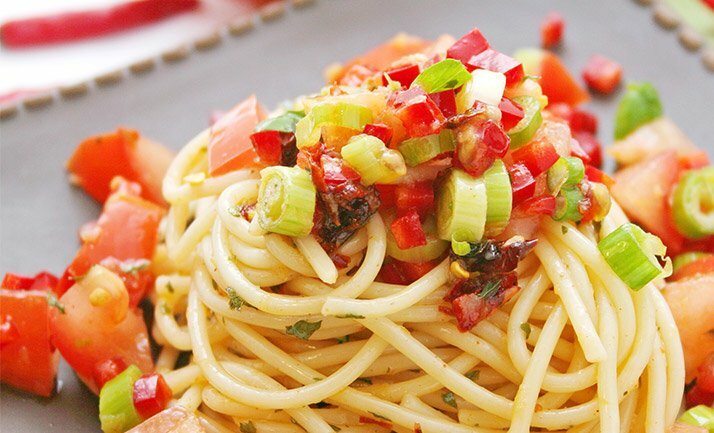 You're most likely well-versed on the benefits of complex carbohydrates. These nutrient-dense starches often pack a lot of fiber, which provides sustained energy—and prolonged fullness. When striving to gain weight, too much fiber may actually be counterproductive, leaving you too full to consume what you need to grow. For best results, incorporate both complex and simple carbohydrates into your diet. Around training is a perfect time to focus on simple carbohydrates. These fast-digesting sugars are quickly available for working muscles without the extra fiber that may lead to stomach discomfort. Consuming carbohydrates such as dextrose or a sports-drink powder as part of a cocktail during your workout will help support hard training, enhance recovery, and protect muscle mass. It's also an easy way to sneak in additional calories for anyone looking to add mass. Other fast-acting carbohydrates such as cereal, granola bars, or white rice consumed after training will further allow you to increase your total calories without feeling overly full. Plus, the spike in carbohydrates will drive a spike in the anabolic hormone insulin, which will quickly shuttle these carbohydrates, as well as other nutrients, to your muscles. A food scale isn't just for weight loss; it's invaluable to optimize muscle growth, too. Once you begin adding more calories to your diet, you'll start gaining weight, but your body will want to fight to return to its equilibrium—its body-fat set point—making further gains even tougher. Eating more food also means your hunger pangs will be less frequent and less severe. To compensate, you're likely to underestimate portion sizes. Measuring your portions with a food scale helps you ensure you're hitting your daily number. Measuring your portions with a food scale helps you ensure you're hitting your daily number. This in turn supports your training and recovery, and provides your body with the fuel it needs to grow. The caloric target you decided on in the first step is likely a substantial amount more than you're used to eating. To simplify the process of consuming significantly more food, split your intake over 5-6 meals per day, rather than just 3-4. It's much easier to consume 3,000 calories across five meals rather than three. If you're unable to finish your meal, you're ultimately missing your daily goal and not taking in enough raw materials for growth. If that's the case, break those calories up into smaller, more frequent meals. Don't be afraid to push to 7-8 meals per day, if that's what it takes. Eating clean means choosing very healthy foods with minimal processing. Normally, that's a good thing. But when you're trying to build muscle, this can actually work against you. Clean foods are often high in protein or fiber, but low in calories. A high-protein or high-fiber meal is sure to leave you feeling full before you've consumed enough calories. Choose calorie-dense foods such as oats, granola, pasta, tortillas, bagels, nuts, and nut butters as often as possible. Choose calorie-dense foods such as oats, granola, pasta, tortillas, bagels, nuts, and nut butters as often as possible. Choosing these foods will help you consume enough calories before feeling too full, because they provide more calorie bang per bite. They're also still rich in nutrients, so you won't miss out on the essential micronutrients. Once a week, treat yourself to a meal that disregards the nutrition rules outlined here. Forgo calorie counting and macro managing at this meal in an effort to take in a mighty surplus of calories. Optimally, eat this meal on a training day, reasonably close in time to your workout. Just make sure you hit your protein minimum! Shakes have long been a staple in the fitness community for convenience and to boost calories. Moreover, liquids digest faster than whole foods, so you're more likely to feel hungry and be ready to eat again sooner. Loading the blender with a combination of yogurt, milk, juice, protein powder, fruit, nut butters, and even oil makes it easy to push the four-digit calorie barrier. You can also cram a lot of calories into a shake. Loading the blender with a combination of yogurt, milk, juice, protein powder, fruit, nut butters, and even oil makes it easy to push the four-digit calorie barrier. What's more, it's much easier to consume liquid calories when you're not feeling hungry. Try choking down a half-pound of chicken breast and two cups of rice when you're not in the mood for food. Need inspiration? Bodybuilding.com has plenty of easy protein-shake recipes on our website. Great Tasting Protein with Minimal Fat and Carbs and Added Digestive Enzymes* Go Now! Eating for growth may start to feel like a second job. That's good, and we want you to treat it as such. With that said, there are three meals that you must never skip (though we strongly argue against skipping any meal in general). When you wake up, chances are it's been more than eight hours since you're last meal. That means you've been in a state of muscle breakdown for one-third of your day. Eat breakfast within 45 minutes of waking up to provide your muscles and brain with fuel. Not hungry? Start your day with a shake. Eat breakfast within 45 minutes of waking up to provide your muscles and brain with fuel. Not hungry? Start your day with a shake. 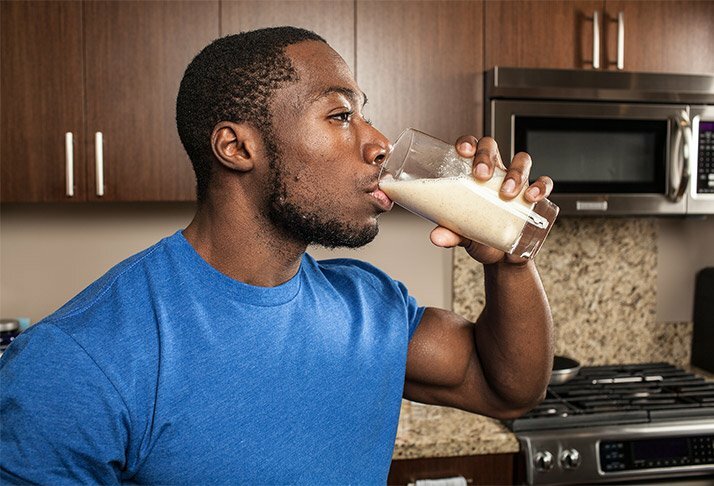 The post-workout shake may not be as crucial as we once thought for muscle gain, but to maximize muscle growth and calorie intake, capitalizing on this opportunity is invaluable. Remember that muscle growth can be a challenging endeavor, especially for ectomorphs and hard gainers. So employing every tactic to gain even that extra one percent will make a difference. A shake (or meal) rich in protein and carbohydrates consumed within 30-60 minutes of finishing your workout will provide your muscles with the fuel necessary to jump-start the repair and recovery process. For those of you who feel hungry after training, this is also an excellent time to consume your biggest meal of the day. Not hungry? Consume a calorie-dense shake. Consuming a meal before bed is one last time to "turn on" muscle building prior to entering an extended catabolic (muscle breakdown) environment. Prioritize protein, preferably a blend of fast- and slow-digesting proteins, as well as healthy fats and complex carbohydrates. You don't necessarily need all three macros at this meal—it will depend more on the quality of the meals you consumed throughout the day—but having all three is just fine. First and foremost, ensure you're getting your serving of protein. A combination of your favorite nut butter, fruit, granola, or oats atop a bowl of progurt (Greek yogurt mixed with whey) is an excellent go-to bedtime snack. Gaining weight can prove to be just as tough as losing weight when striving to do it the right way. Don't become frustrated. Stay patient, and realize that change takes time. If muscle growth were easy, we'd all be walking around looking like Arnold. Food is your fuel! It will support hard training, quick recovery, and ultimately, muscle growth. But if you stay consistent, adjust accordingly, and never miss a meal, you'll set yourself up for success. Fernandez, M. L., & West, K. L. (2005). Mechanisms by which Dietary Fatty Acids Modulate Plasma Lipids1. The Journal of Nutrition, 135(9), 2075-2078. Vaughan, R. A., Garcia-Smith, R., Bisoffi, M., Conn, C. A., & Trujillo, K. A. (2012). Conjugated linoleic acid or omega 3 fatty acids increase mitochondrial biosynthesis and metabolism in skeletal muscle cells. Lipids in Health and Disease, 11(142), 2090-2098. Solfrizzi, V., Colacicco, A. M., D'Introno, A., Capurso, C., Torres, F., Rizzo, C., ... & Panza, F. (2006). Dietary intake of unsaturated fatty acids and age-related cognitive decline: a 8.5-year follow-up of the Italian Longitudinal Study on Aging. Neurobiology of Aging, 27(11), 1694-1704.